KC Robotics Inc., booth 7711 at Automate 2019, will introduce the Redline EZ-Load system, a user-friendly, compact, robust and economical machine tending solution aimed at helping manufacturers address the skilled worker shortage. 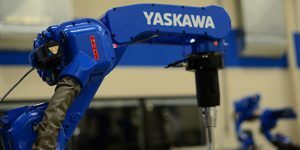 At the heart of the machine tending system is KC Robotics’ intuitive user interface and Yaskawa’s collaborative robot technology. 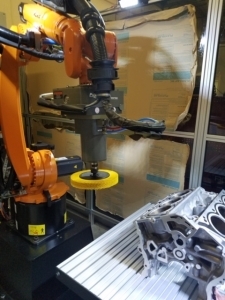 In addition to the EZ-Load system, KC Robotics will showcase their robotic welding expertise and demonstrate a material removal system developed in partnership with 3M Corporation and Pushcorp. KC Robotics, Inc. has achieved the prestigious Certified Robot Integrator status with the RIA. To become certified, integrators go through a rigorous process including an on-site audit and hands-on testing of key technical personnel. Robot integrators who are certified by the RIA are recognized in the industry as part of an elite group of accomplished, trustworthy professionals. “We are very excited to achieve RIA Certified Integrator status. This certification not only helps validate our business systems and continuous improvement processes, but showcases the capabilities of the strong team we’ve put together”, says Crystal Vezey, KC Robotics’ Business Manager. “The RIA Certification is a major accomplishment for KC Robotics” says Paul Carrier, Operations Manager. “We set goals five years ago to improve company culture, employee expertise, customer service and communication. This certification is the culmination of our efforts. We are so proud of our employees! Their buy-in to each objective is what made this work.” The RIA certification is on the heels of unprecedented growth. KC Robotics’ current year sales are on track to increase 30% over 2017. 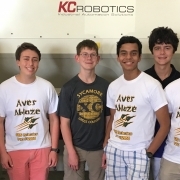 KC Robotics was ablaze with Sycamore High School students on October 9th when the Sycamore Aves Robotics Team visited our facility to see robotics systems in progress and learn more about the industry and job opportunities. After an interactive tour, the team demonstrated their new robot developed for the First Tech Challenge. KC Robotics’ engineers and technicians offered solutions to some of the issues the team experienced with their first prototype. Manufacturers worldwide are having a difficult time finding and retaining skilled workers. According to the latest Gallup Manpower “Talent Shortage Survey” 44% of employers across the globe report they cannot find the skills they need. In the United States, the BLS reported that in April 2018 there were 6.7 million job openings and in May 2018 there were just over 6 million people the BLS classified as unemployed. The shortage is reaching a critical point. If the trend continues, job openings will eclipse the labor pool for the first time. This trend will only get worse as the “baby boomers” continue to retire at a pace faster than subsequent generations can fill them. Based on a study by The Manufacturing Institute and Deloitte, Forbes reported in 2017 that 22% of skilled manufacturing workers, or 2.7 million employees, are retiring over the next decade. Education and Automation will be the best solutions for manufacturers and industry. The solution for most manufacturers will be education and automation. A good public relations plan and higher wages would also be helpful. Education: Although many school districts and technical colleges throughout the country offer good programs in manufacturing, welding and robotics, they are not equipped to train the number of skilled workers needed. To overcome this obstacle, some companies have begun in-house training for their own unskilled workers to develop them into higher skilled employees. Others offer apprenticeships and technical college education for new hires. Automation: Increased automation and robotics in manufacturing solves several problems: It decreases the number of skilled and unskilled workers needed, and it creates safer, cleaner and more efficient manufacturing environments. Wages: With the economy growing and the number of workers decreasing, higher wages are inevitable (and a reality for many companies already). Image: The image of dirty and non-progressive manufacturing work place hurts recruitment of qualified skilled labor. Manufacturing has become much more technical, many factories are clean and high-tech, and jobs are more interesting than in the past. The manufacturing environment is increasingly automated. The workforce of the future will need to be better trained and educated than past generations. Facing the skilled worker shortage means creative problem solving and embracing and implementing the solutions discussed above. The key to our continued success will be a combination of automation of our manufacturing processes and educating our workforce to utilize the technology to its fullest. The companies that can accomplish this will be the winners in the next industrial revolution. My Daddy’s Robots Are Orange! 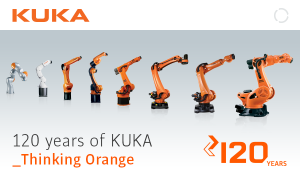 Last Friday, I received an email from KUKA – celebrating 120 years of providing innovative ideas and solutions for manufacturing processes. The feature picture (see below) says, “Thinking Orange”. It reminded me of a story I heard from Jerry Schrott, Applications Engineer at KC Robotics. When five-year-old Mallory Schrott colored a robot picture at her preschool class, her classmates told her she colored it the wrong color. Mallory, whose father is an Applications Engineer and Project Manager at KC Robotics, colored her robot ORANGE. The other preschoolers colored their robots grey and black. 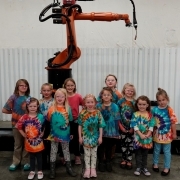 Mallory quickly retorted to her classmates, “My daddy’s robots are orange!” And indeed they are! Many of the robots that Jerry Schrott programs and integrates for KC Robotics’ customers are KUKA Orange. Mallory has visited our office many times and take great interest in the robots. And she knows her colors! KC Robotics is proud to be a KUKA System Partner. 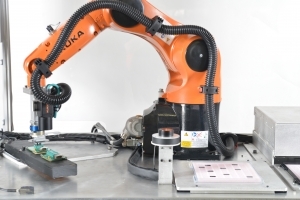 Our experience integrating and installing KUKA robots spans various industries and applications, including Plastic cutting, Palletizing, welding, and specialized applications for defense research. /wp-content/uploads/2018/01/kc_robotics.png 0 0 Connie Carrier /wp-content/uploads/2018/01/kc_robotics.png Connie Carrier2018-08-15 19:51:532018-08-15 19:51:53My Daddy’s Robots Are Orange! What is a Robotic Integrator and why do I need one? Robot Integrators customize the robot to fit the needs of the end user’s application. The Robot Manufacturers do not usually do this because they do not have the staff or resources to handle the needs of all end users. Integrators fill this gap with specialized design, engineering and programming resources. A good integrator is a process specialist and is trained and supported by their robot manufacturer partner. They will help to define the problem or need in the end user’s process, find a solution, build it and test it. They will then integrate the robotic solution into the customer’s manufacturing processes and provide training to make sure that the end user can operate and maintain the system properly and successfully. Robot System integrators are not experts in every application. They will specialize in a select few. Most applications are very process intensive and selecting an integrator with a skillset that matches your application is key. You may want to think twice about selecting an integrator that specializes in material handling to do a welding application. Look for an integrator that has a track record of successful applications similar to yours. If your system requires custom tooling, find an integrator with experience in the type of tooling you need. The End of Arm Tooling gives your system functionality. A good integrator will understand the functional requirements of the tool and guide the tool-maker on design, payload, moment of inertia, and process requirements. Consider the concept of the system closely. You want to make sure that the process is balanced and that you are not solving one issue by creating another. How is the integrator utilizing the features and technology within the system? Are you able to shrink the footprint of the cell or take advantage of a collaborative application by utilizing Functional Safety? Is the integrator rehashing something that was done once 20 years ago without taking advantage of today’s technology? A good integrator is a creative problem solver. Make sure the true cost of your robotic system is clear in the proposal. Find out what the actual deliverables are so you can compare proposals more effectively. Understand the payment terms for the system. An integrator might charge 30% down with the order and then a milestone payment when the system engineering is approved. And then other payments along the way. Discuss how the integrator handles engineering change orders. Lead times to delivery fluctuate. Can the integrator deliver your system within the timeframe you are looking for? In 2012 the RIA rolled out a Certified Robot Integrator Program in response to the needs of the industry. It is a benchmark for evaluating technical and robot safety as well as the overall business practices of integrators. The certification involves a rigorous process that includes an onsite audit, practical assessment of key personnel, safety training, etc. As your integrators if they are certified or working toward certification. Also contact the robot manufacturer and ask if the integrator is part of their certified partner program and in good standing with the robot manufacturer. /wp-content/uploads/2018/01/kc_robotics.png 0 0 Paul Carrier /wp-content/uploads/2018/01/kc_robotics.png Paul Carrier2018-08-03 19:08:022018-08-03 19:08:02What is a Robotic Integrator and why do I need one? With over 28 years of experience in design, programming, installation, training, and sales of robotic equipment, Leo is well-recognized in the robotic automation industry. He has experience in multiple robot brands and a strong background in robotic welding. He comes to KC Robotics from KUKA Robotics where he was a Sales Application Engineer since 2008. 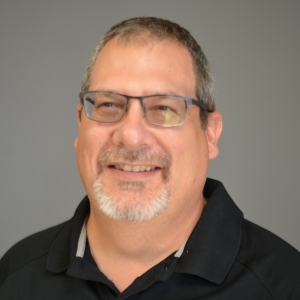 Prior to that, he was a Project Engineer for Progressive Systems, a Project Manager for PRI Robotics, and a Robot Technician for Automated Concepts. 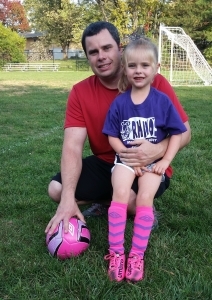 In addition, Leo retired as an Engineer Captain from the Army National Guard. Leo is the fifth new hire at KC Robotics in 2018. His depth of industry knowledge will further strengthen the systems group and support new sales. The company is expecting unprecedented growth over the next three years. Current year sales are on track to increase 30% over 2017. KC Robotics is a process-driven robotics systems integrator to a wide range of industries, specializing in arc welding, material handling and material removal applications. As an authorized integrator for KUKA Robotics, Yaskawa Motoman and ABB Robotics, KC Robotics is committed to improving customers’ profitability and productivity through automated solutions. For more information about KC Robotics, visit www.kcrobotics.com. My view is much more optimistic. I believe automation is a necessity in the near term to maintain productivity. In the long run, we may even improve current lifestyles and collectively work better – fewer hours, for one, but also more safely, more healthily – with the help of AI.